It's springtime, and that means the annual fundraiser for the Bass Museum of Art is upon us. This is one of Johnny Boy's favorite fundraiser's: there is always a terrific silent auction ( I scored 3 pieces of art last year) and the debut of their new exhibition. This year they are celebrating the opening of the exhibition From Picasso to Koons: The Artist as Jeweler, curated by French curator and jewelry collector Diane Venet. A Night at the Museum is next Thursday, March 14, 2013 from 8pm - 11pm with Johnny THE Boy DJ'ing (not little ol' moi). With co-chairs like the fab Christina Getty-Maercks and Criselda Breene, and sponsors like Christie's, Perrier, and Cultured Magazine, this promises to be a night to remember. Tickets are only $250 and admits two people, in addition to renewing your membership for one year. Don't forget to bring your credit card / checkbook / cash, because silent auction items like a private cooking class hosted by James Beard award winning chef Michelle Bernstein and President's Box Tickets for Priscilla Queen of the Desert at the Arsht Center with VIP Treatment will be up for grabs. You can purchase tickets here. 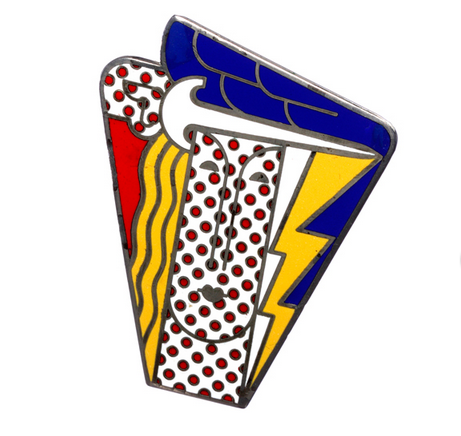 Check out Roy Lichtenstein's Modern Head brooch that will be on display, LOVE IT!